The car battery is drained. You have a car battery charger in your garage, but how long time will it take to charge my dead car battery? 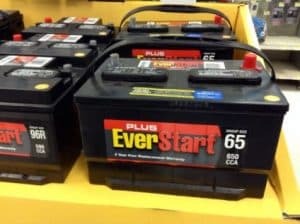 Charging a car battery is not always as easy as it sounds; there are several tricks out there to save your battery and give it a longer lifetime! In this article you will get all the answers you want for this question, and a bit more! 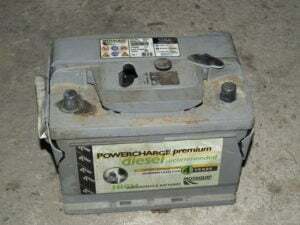 How long time does it take to charge a dead car battery? Charging a dead car battery takes between 4 to 24 hours for a full charge, depending on how many Amperes your car battery is charging with and the size of your battery. The most common rate for car battery chargers is around four amps. To fully charge a battery of the size 52Ah would take about 10 hours from dead to fully loaded, but you would probably be able to start your car within 1 hour. First, you have to take a look at your car battery charger of how much ampere it’s giving out. High amperes do charge your car battery faster. Low ampere is better for maintenance charging your battery over long periods. You do also have to take a look at the size of your car battery and the battery type. Usually, a mid-sized car uses a battery of the size 40-80Ah. You also have to take in mind of the kind of car battery. An AGM/GEL battery can charge up a bit faster than a regular wet battery. If you charge your car battery with 40 amps it will be fully charged real quick, but can it damage my battery? Take a look at the next chapter, and we will figure it out! How fast should I charge my car battery? The speed of your car battery charging should depend on what you want to acquire. Fast charging can damage your battery and will make the life shorter of it. Long-time charging with low amps is the best for keeping the battery’s lifetime long. Usually, a standard car battery charger is giving out 4-15 amperes. 2-4 ampere is typical for a maintenance charging, and it will take around 24 hours to charge a dead battery at this load fully. Check your car battery for any settings for the charging rate and apply the charging rate for your needs. If you want to charge your car battery quickly, without damaging your car battery, I would recommend charging your battery at the rate of 8-15 amperes. Charging your battery over 15 amperes can damage your battery if you are unlucky and will make the life shorter of it. If you want to start your car quickly, I would recommend using a Jump Starter instead. 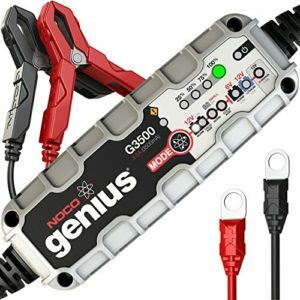 They will start up your car within seconds and are a lot more user-friendly than the old style Jumper cables. Jumper cables can be connected wrong and cause severe damages to your car’s electric system. Modern jump starters are often wrong-polarity secured and will not give that many sparks(Fire-friendly). What car battery charger should I use? First, you have to find out what you should use your car battery charger to see what amp rates you want for your charger. Modern chargers are easy to connect and have a battery charging monitoring which will regulate the amps itself. But you should anyway check how much amps it’s charging. Cheaper chargers do often promise more amps than it charges with. In my opinion, it’s better to choose a quality charger which gives lower amps instead. It will save your car battery, and it will minimize the risk of damages to your vehicle. A car battery charger that I really can recommend is the CTEK chargers. You can find them here on our list “Best Car Battery Chargers.” They have several sizes of their chargers for your need, and it’s a well-known brand that is probably making the best car battery chargers on the market. Charge a mid-sized car battery with a typical charge amp of around 4-8 amperes will take about 10-24 hours to charge it fully. To charge your battery to be able to start your car, it would take around 2-4 hours. You can charge your car battery fast, but it may cause damages to your car battery. If you have any other questions about car batteries, you are welcome to comment down below, and I will answer all your questions as fast as possible. If you have any other car questions, you are welcome to ask them at our homepage. I have a 2009 Fiat Punto 1.9 in a 2 litre. The car has been standing for a very ling time and the battery is totally flat. I have a Battery Carger 4 AMP 12/230 VOLT. It’s not a problem to charge it with a charger that is charging it slowly, it’s actually better than a fast charger in these situations. However make sure that you are connecting the positive and negative clamp on the right connectors when the battery is flat! I want to recharge a varta E11 battery but there is no way to get to the distilled water caps to unplug them. Would it be dangerous to go ahead and charge anyway?